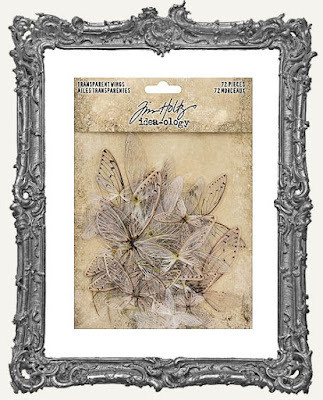 Brand New Tim Holtz Idea-ology! 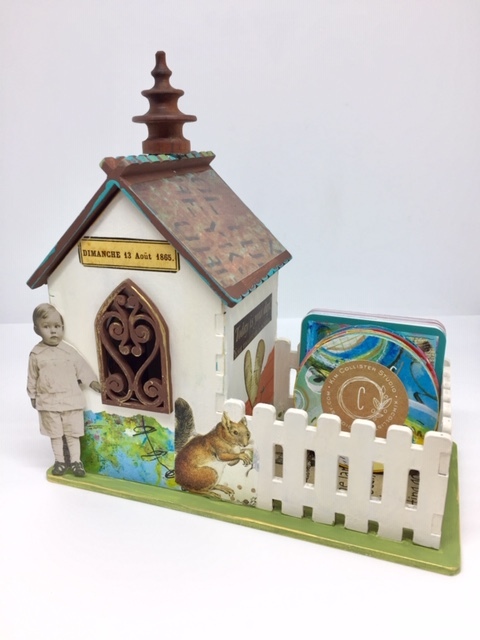 New ATC Cottage House Kits + Windows! I'm so excited that our fabulous ATC Cottage House Kits are now available in two more styles, without windows! These Kits are perfect if you want more room for collage and mixed media goodies! 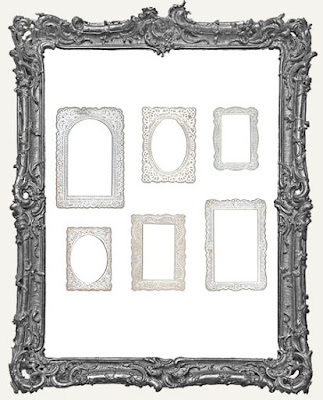 Also, the windows from the other kits are also available on their own in sets of 4! 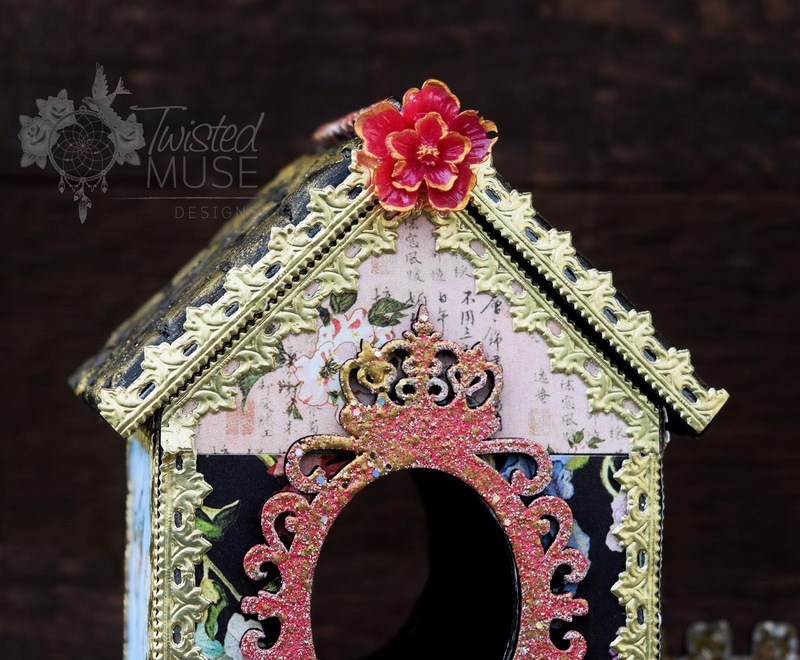 The windows are so lovely, and perfect for tags, ATCs, journals, shrines, and just about any mixed media project! I know some of you loved them so much, you wanted more! So there you go! You can also use the new window sets on the new plain House Kits with an image behind them for another style option! 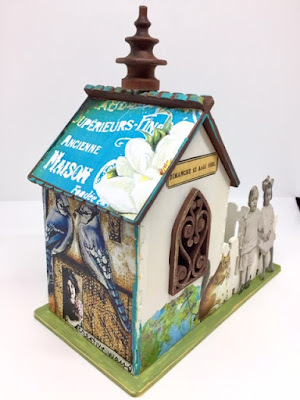 Tea Cottage Inspiration by Kim Collister! 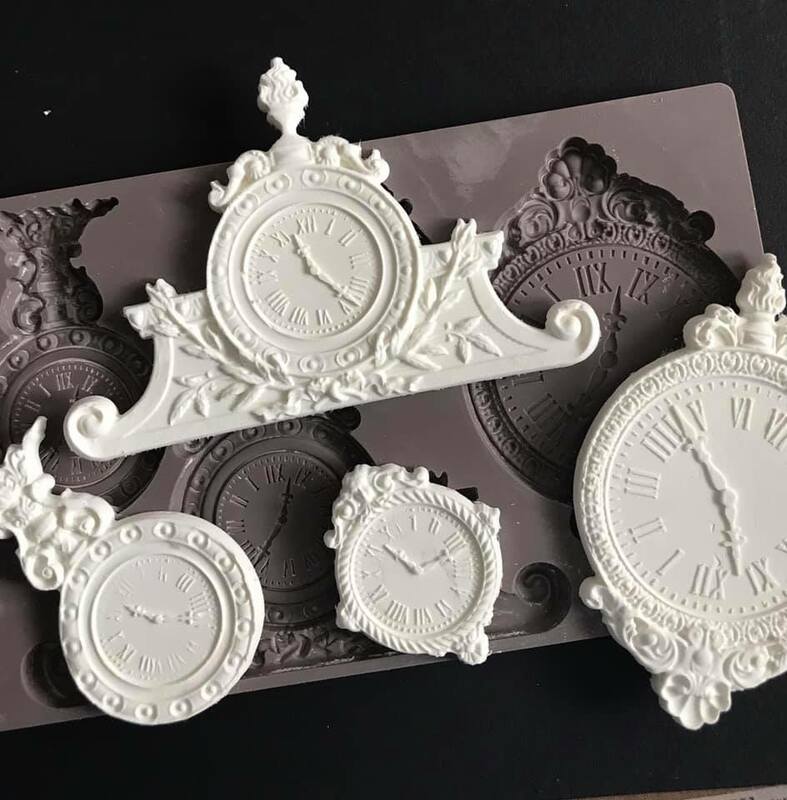 More Prima Modeling Material Samples! Several of you have had a chance to try the Prima Air Dry Modeling Material now, and all of the reviews have been 5 star! 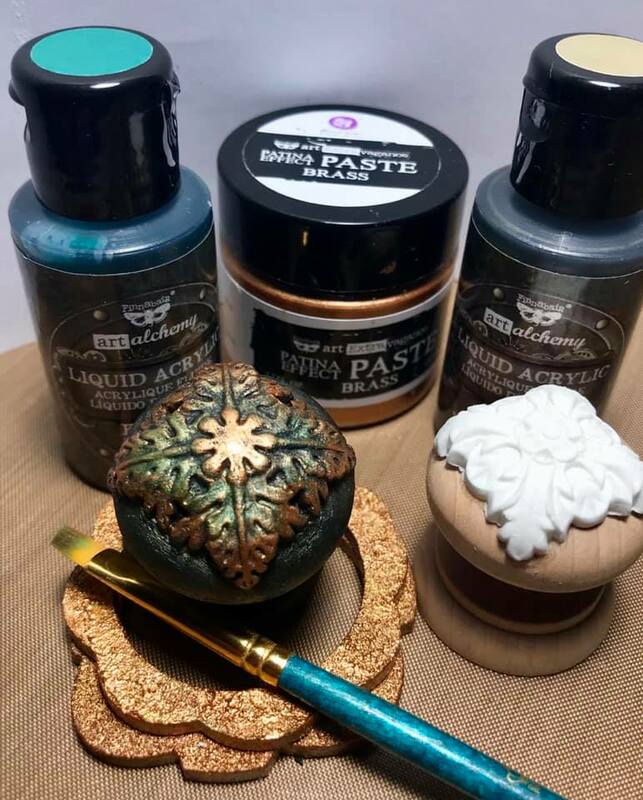 I recently restocked this magical stuff, so come grab some while you can! 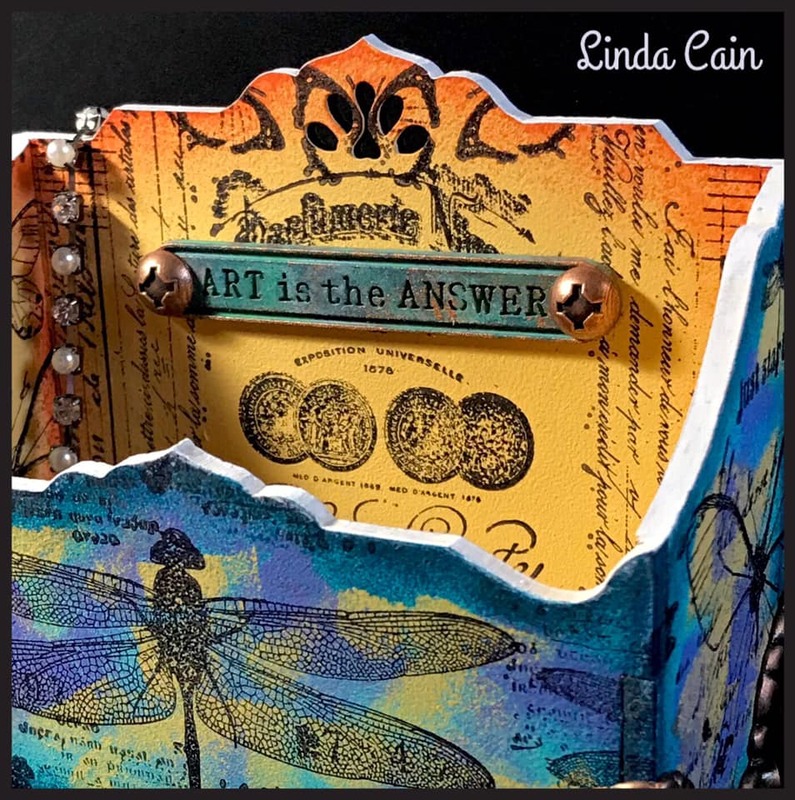 Linda has been playing with the Prima Air Dry Modeling Material again this week. 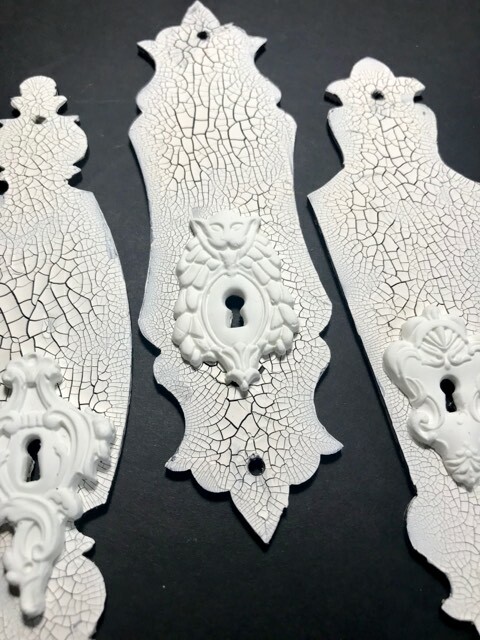 Above is a recent step-out photo from her WIP using the Prima Molds, Modeling Material, and Escutcheon Door Plates. Stay tuned for this amazing project! 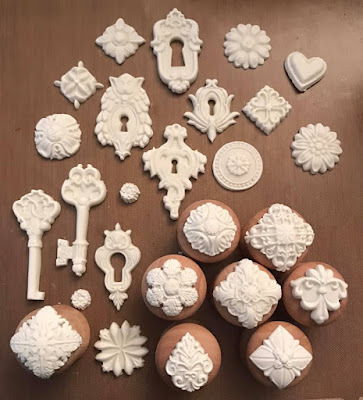 Linda created the knobs below with the Curio Trinkets Mold and our Wood Knobs. And of course the modeling material. 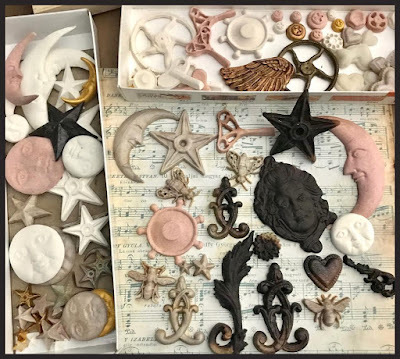 These knobs make a GREAT embellishment for mixed media projects!!! They don't have to be functional knobs. They certainly can be, but have tons of other uses too. Finnabair Gessos and Heavy Gel! The amazing Finnabair Gesso Mediums (white, black, and clear) are now available in the shop. 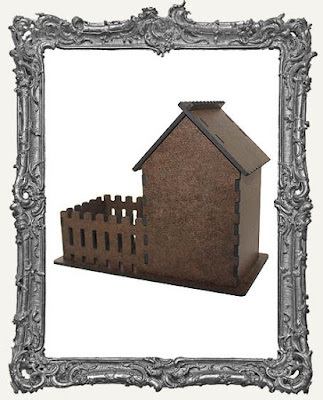 These mediums are a must have staple and are used as a base for SO many projects, like the altered tin below. 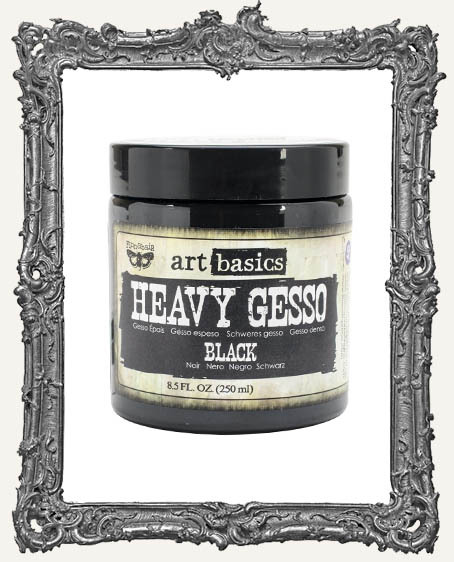 This gesso is also perfect to use on or masonite or chipboard, so your paint etc. goes on like a dream! We also have the Heavy Gel listed now too. The gel dries clear and you can make your own pastes by mixing in paint, mica powders, glitter, micro beads, and so much more. 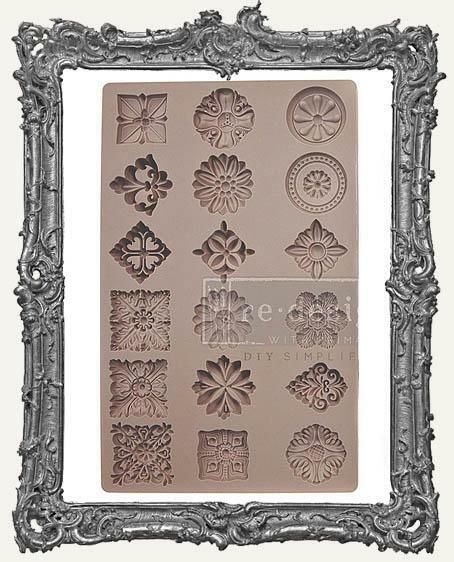 Your custom pastes can then be used with stencils or as an embellishment. You can also use the Heavy Gel to glue down objects. Another must have staple with tons of uses! 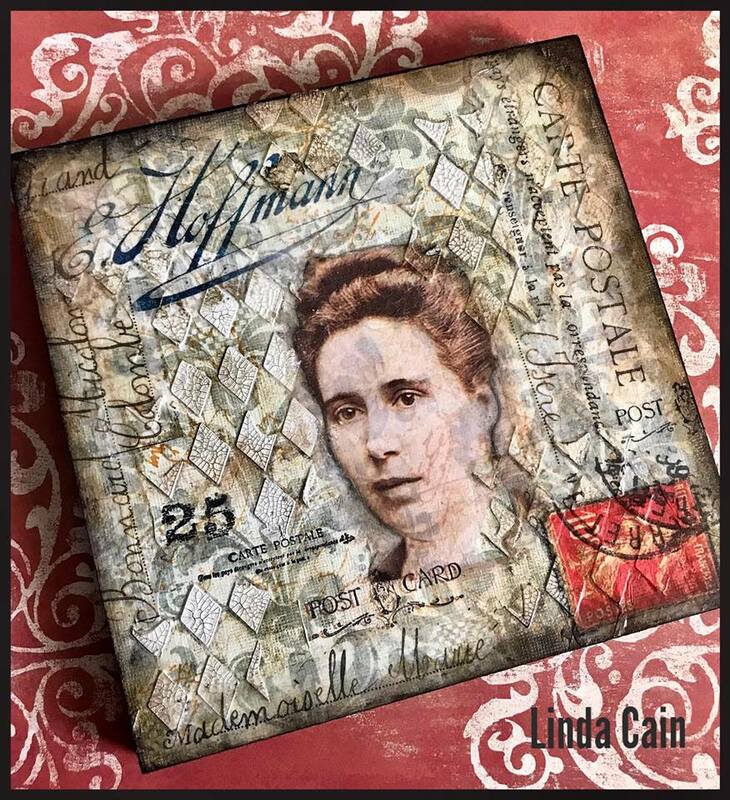 Linda Cain said it's her favorite Finnabair Medium. 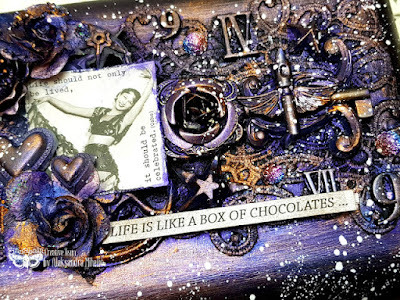 You can find the altered tin video by Anna HERE or by clicking the photo below! The BRAND NEW Prima Air Dry Modeling Material is HERE! I've been drooling over this stuff, and I'm so happy it's finally in stock. It works like a dream, and is SO easy to use. Plus you get a TON OF IT in each bucket. Yes, you get a bucket and you will use it. I've been told it has a shelf life of 2 years, which I'm sure you won't need. Linda Cain has been playing with this magical stuff this week. See what she had to say below! 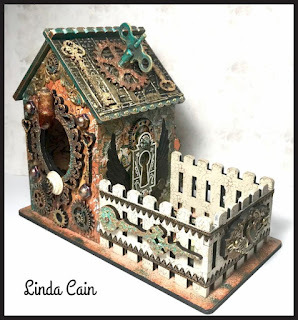 Linda has been playing with the Prima Air Dry Modeling Material and the verdict is in! It's WONDERFUL! She said it's very easy to work with and takes paint really well (no gesso needed). 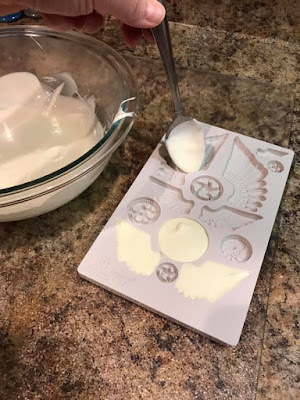 A dusting of cornstarch in the molds first wouldn't hurt, but wasn't necessary with this stuff. If you plan on gluing your cast pieces to a curved surface (like a knob), let the clay dry about half way, and then glue to your surface while still a bit wet and pliable! Linda created the knobs below with the Curio Trinkets Mold and our Wood Knobs. 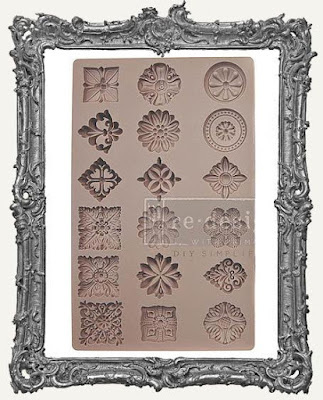 And of course the clay. 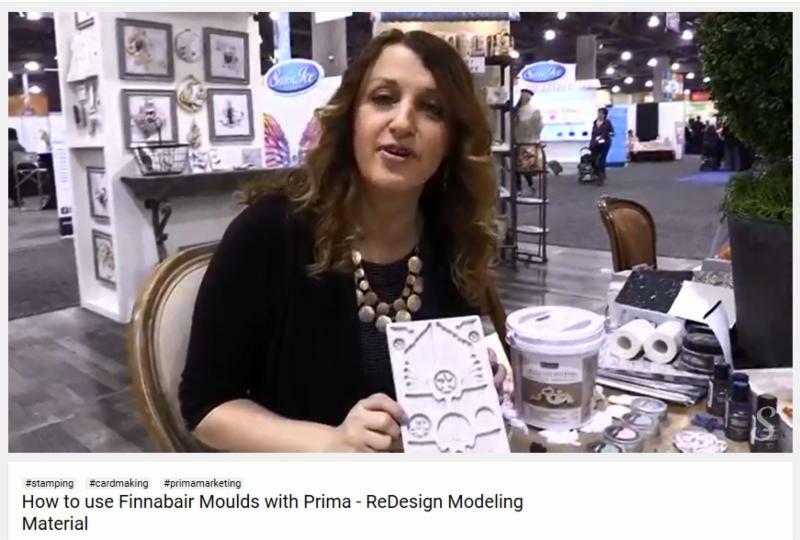 See a quick video on using the Prima Air Dry Modeling Material! Ornate Fairy Box by Linda Cain! 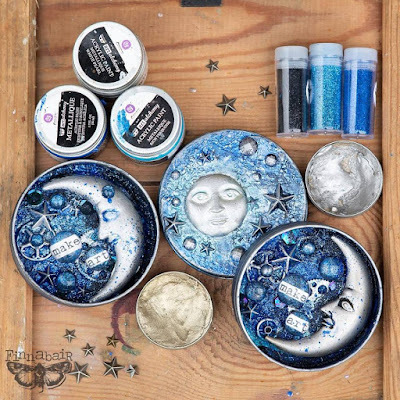 Altered Tin Video by Finnabair! We love this altered tin by Finnabair. 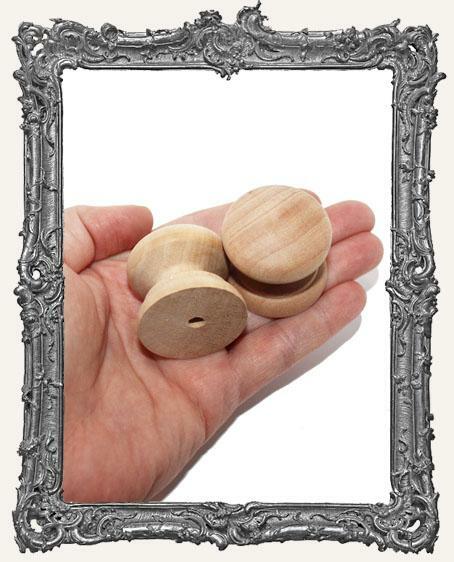 You can find many of the goodies to make it in the shop HERE. 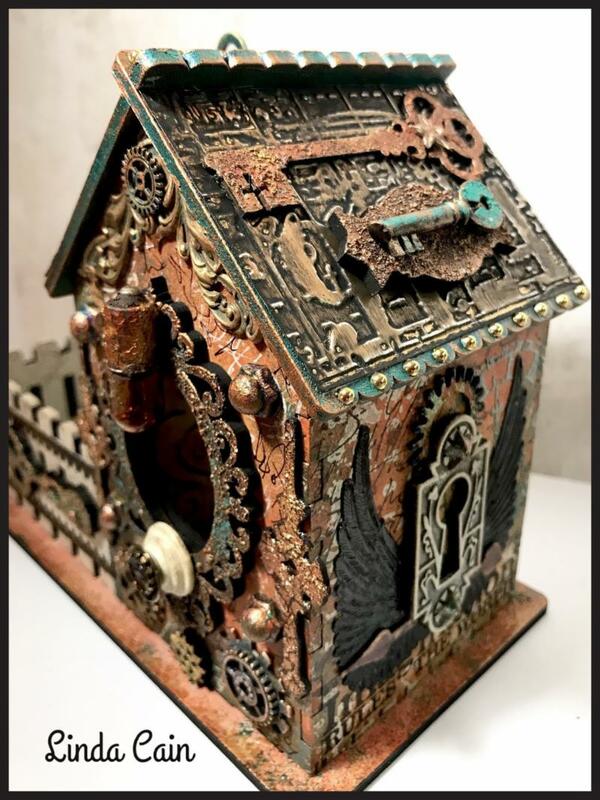 And keep in mind, you don't have to limit the techniques to a tin. 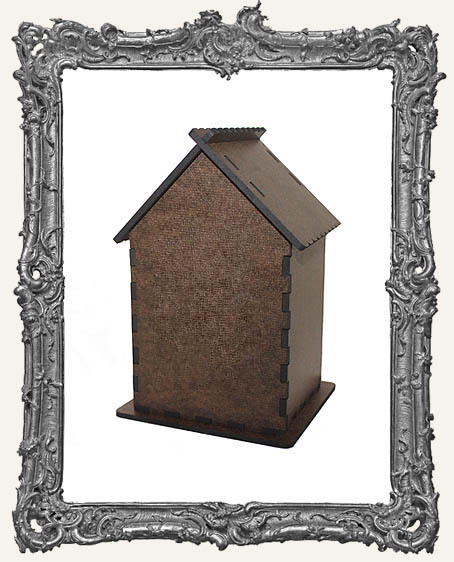 Many of our Shrine Kits and Shadow Boxes would be perfect too. You can find the full video by Anna HERE or by clicking the photo below! I was excited to get a mention in the video also. I was the one who made the "white and blue chocolates"!!! Happy weekend everyone! 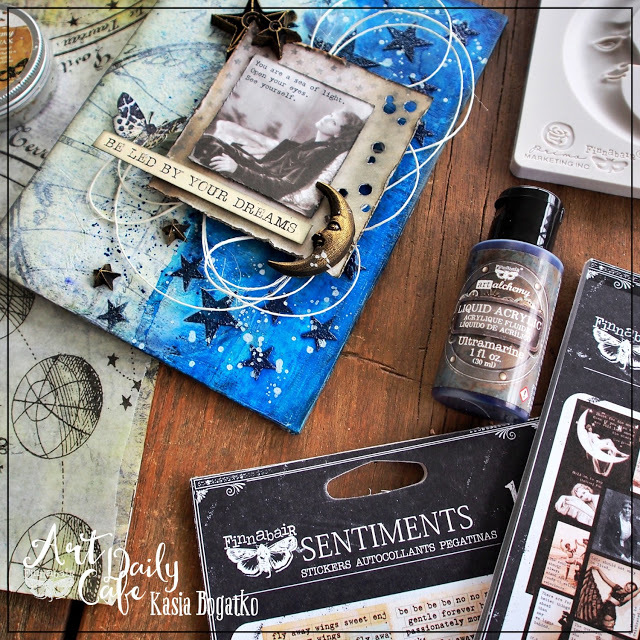 I'm so excited about the Finnabair Art Daily goodies just listed in the shop! Awesome ephemera (can't have enough! ), washi tape, clips, and more! 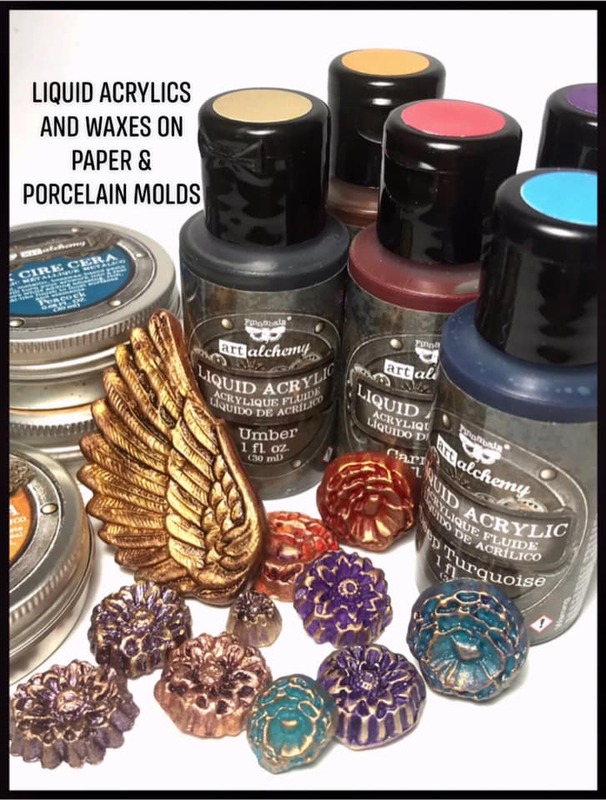 And of course they work perfectly with all the other newly listed Finnabair goodies (waxes, molds, liquid acrylics, ALL OF IT)! Here are a few photos from Anna's blog (used with permission) to highlight some of the newly listed goodies. 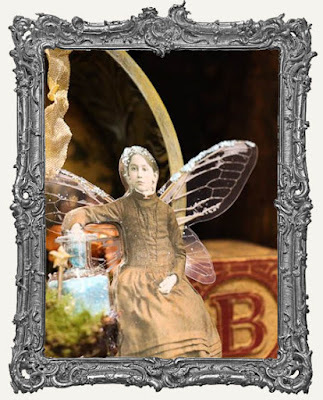 You can find even more on the Finnabair Blog. 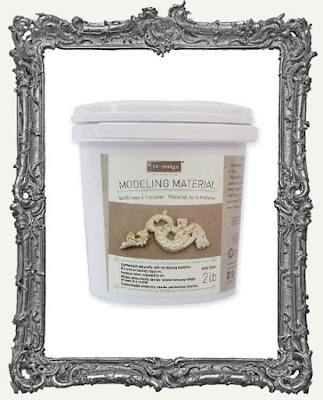 The BRAND NEW Prima Air Dry Modeling Material is HERE! 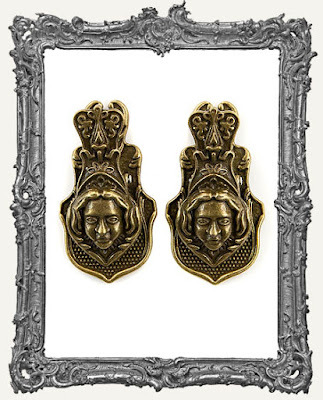 I've been drooling over this stuff, and I'm so happy it's finally in stock. It works like a dream, and is SO easy to use. Plus you get a TON OF IT in each bucket. Yes, you get a bucket and you will use it. I've been told it has a shelf life of 2 years, which I'm sure you won't need. Watch the awesome video below to see how easy it is to use. And of course it works perfectly with all the new Finnabair goodies! 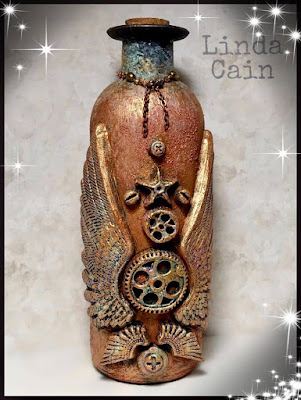 Art Daily Inspiration by Linda Cain! Design Team Member Linda Cain created this lovely card that beautifully highlights bits from the Vintage Photo Booth and Sentiments Sticker Pads. Linda and I both agree that the sticker pads are awesome! High quality and you get LOTS. Definitely a staple to keep on hand. Design Team Member Linda Cain has been having even more mold fun too. 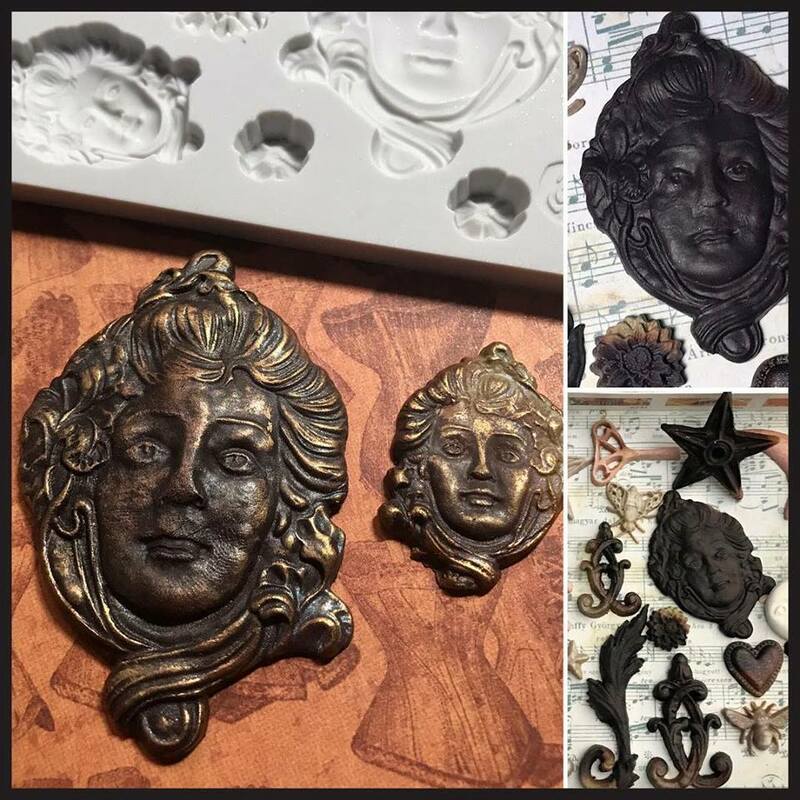 I especially love these pieces from the Art Nouveau Mold created from Black Clay and Finnabair Waxes. So amazing Linda! 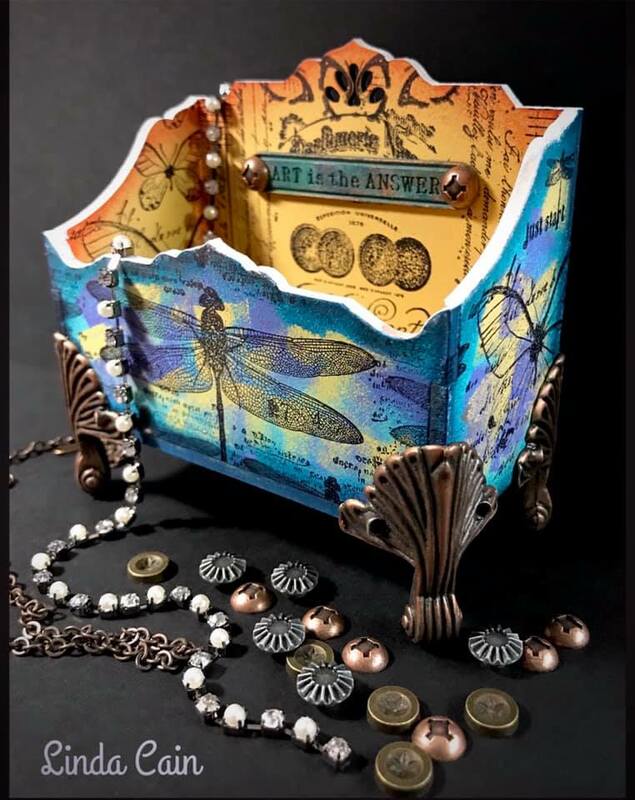 ATC Cottage Inspiration by Chrissy Colon! 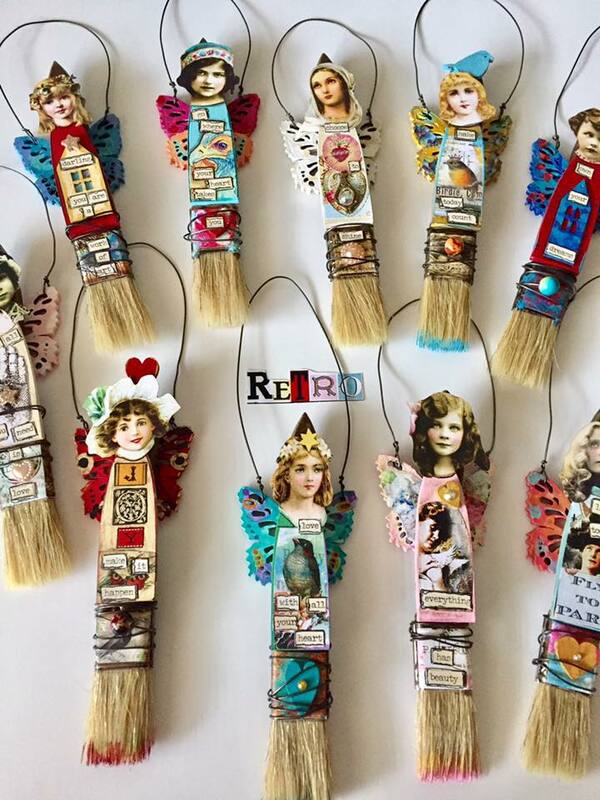 Design Team Member Chrissy Colon has a wonderful project for you! From Chrissy: "I absolutely LOVE Japanese and Asian art styles and living here in Okinawa just adds reinforcement to that love. I've been hoarding Graphic45's "Bird Song" collection since it debuted several years ago. When I saw these cottages for the first time, I ran upstairs, pulled it out of the drawer, blew the dust off, and began hacking into it with a frenzy. I knew exactly how I wanted this darling to look." Hop on over to Chrissy's blog for the tutorial and more incredible details! 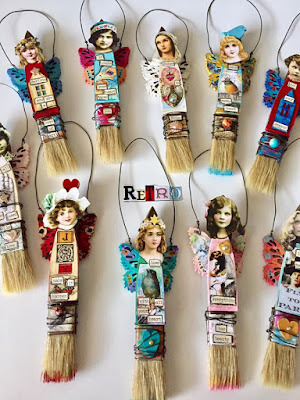 Paint Brush Doll Inspiration by Kim Collister! Design Team Member Kim Collister has created some adorable Misfit Fairies! 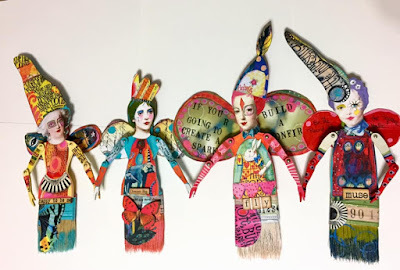 From Kim: "I hope you enjoy my little Misfit Fairies and if you decide to join the fun and make your own, just remember, embrace all the imperfections, embrace your uniqueness, the only limits to this art doll is your imagination." 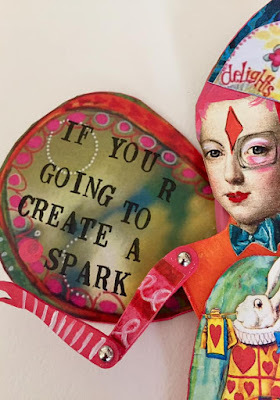 Check out Kim's blog post for even more inspiration, fun photos, and links! 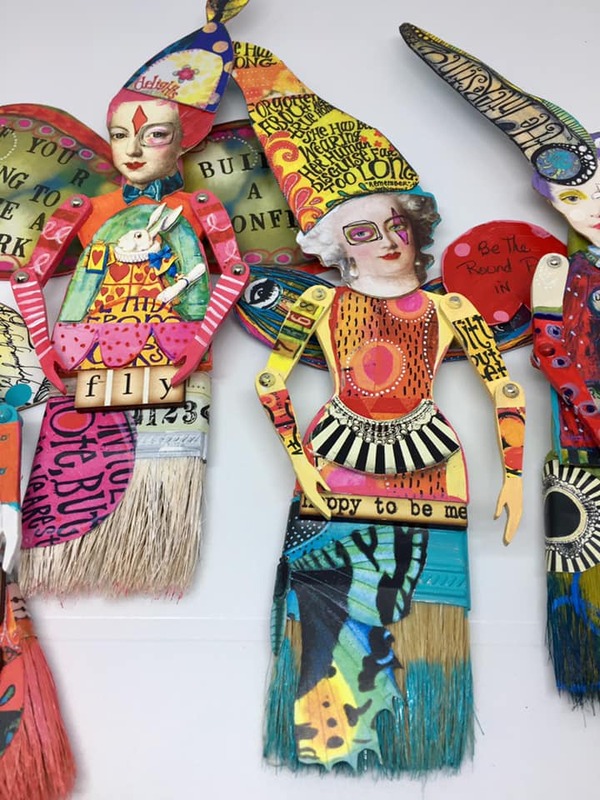 Kim Collister used the Medium Paint Brush Dolls for these fabulous gals, but she has also created amazing pieces using the Skinny Paint Brush Dolls in the past. Both are tons of fun! Canvas Inspiration by Linda Cain! 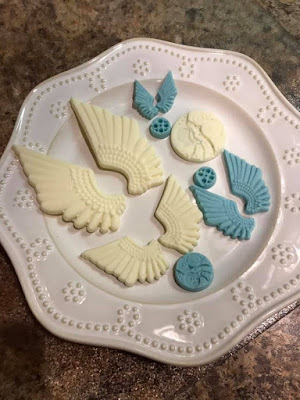 Design Team Member Linda Cain has been having even more fun with the delicious new Finnabair products. 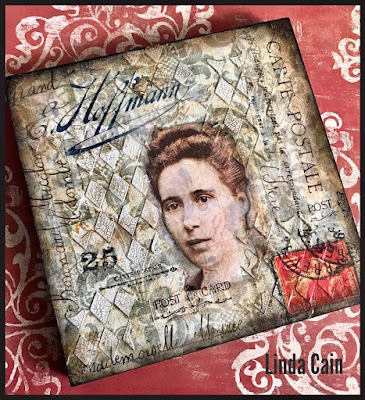 The Carte Postale Tissue Paper, Liquid Acrylics (all back in stock), and Carte Postale Stamp Set are a few of the highlights on this project. From Linda: She's done. "Late night creating and I'm calling her complete. 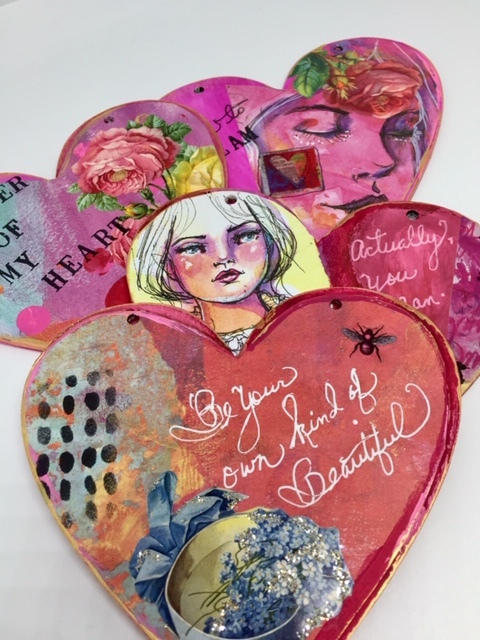 She's on an 8x8 wooden substrate with tissue paper, stenciling, stamps and liquid acrylics." 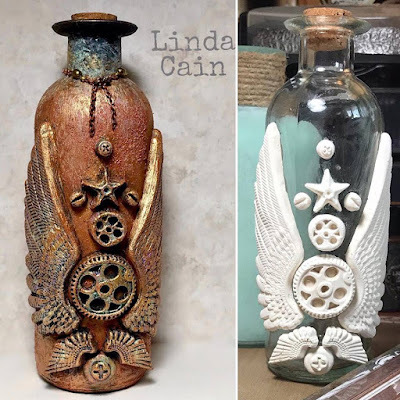 Steampunk Bottle Inspiration by Linda Cain! 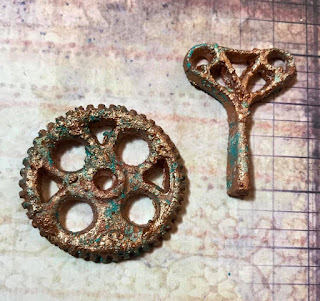 A plain glass bottle becomes a Steampunk artifact in an afternoon. Love working with various colors of Finnabair Rust Pastes, Moulds, Art Alchemy Paints and Waxes." 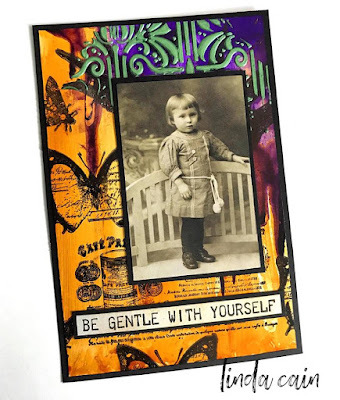 ATC Cottage Inspiration by Kim Collister! 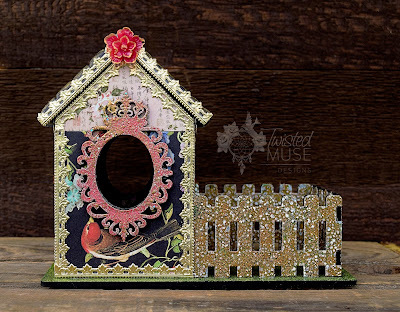 Design Team Member Kim Collister has completed her third stunning ATC Cottage and it's one you don't want to miss. Hop on over to Kim's blog post for more stunning photos, links, and inspiration. So divine Kim! 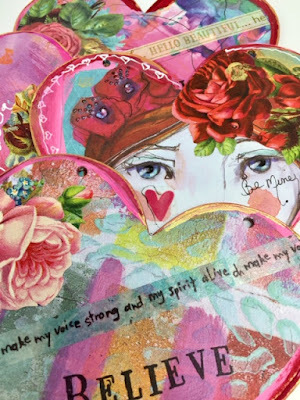 Heart Journal Inspiration by Kim Collister! 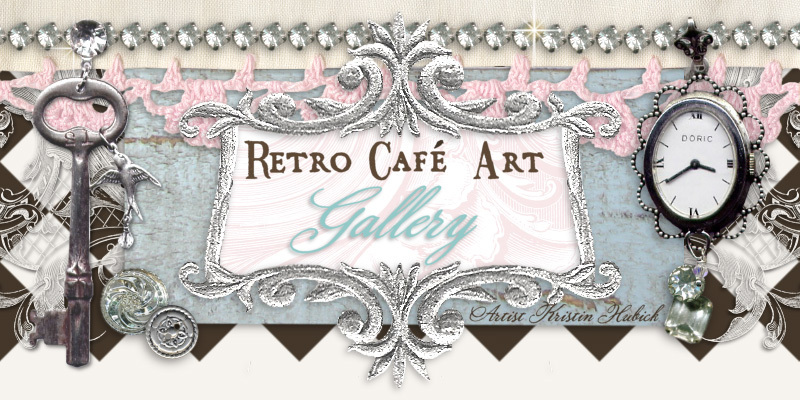 Design Team Member Kim Collister has another treat for you. She transformed our Chipboard Heart Book Kit into the lovely masterpiece you see below. Check out Kim's blog post for even more photos, including each of her individual pages! So pretty Kim! 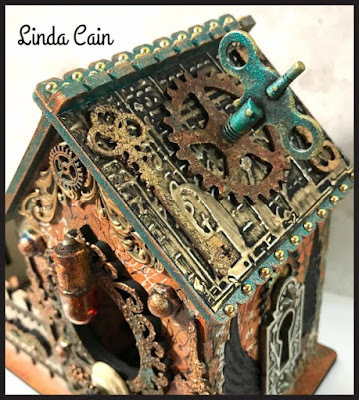 ATC Cottage Inspiration by Linda Cain! 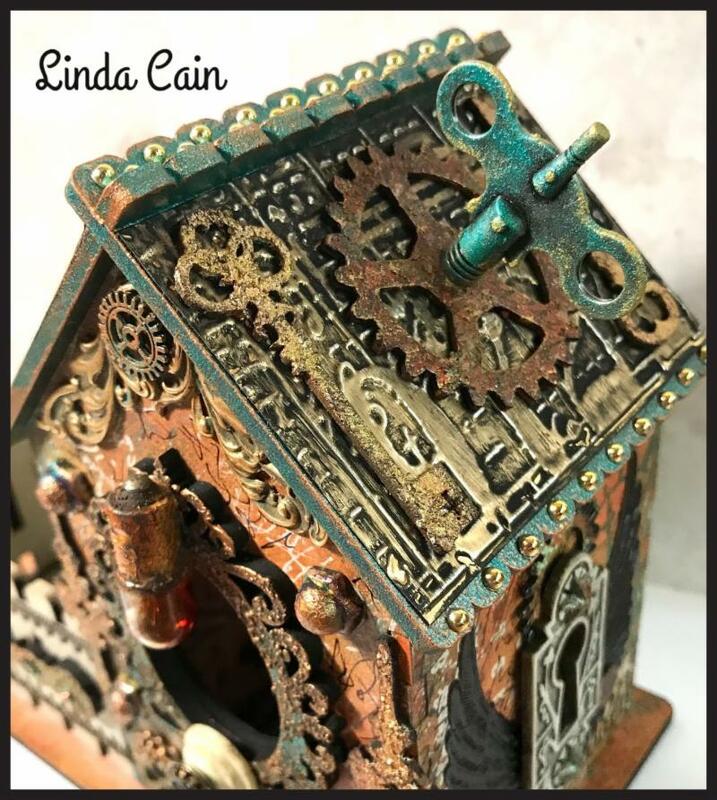 Design Team Member Linda Cain, the queen of all things Steampunk has created a breathtaking Steampunk Cottage! 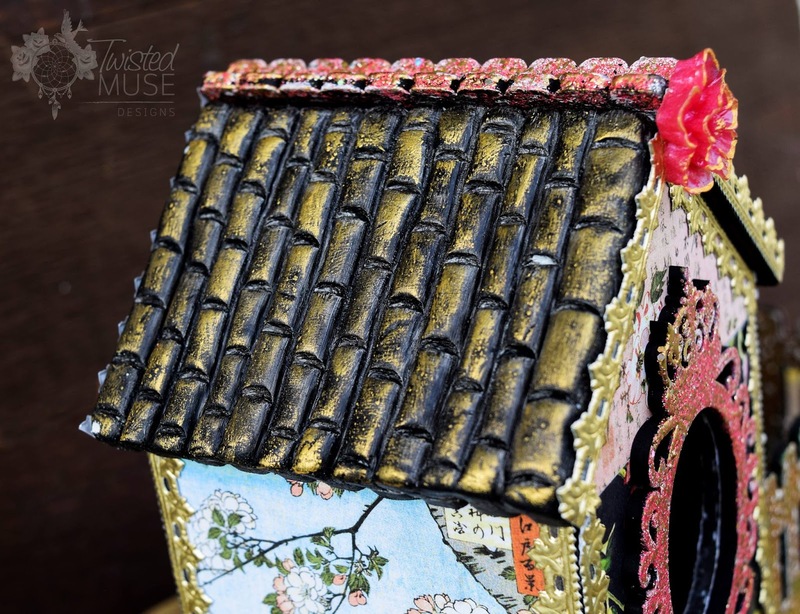 Her piece has so many incredible details, which you can read more about in her blog post! Hop on over for more photos, links, and step-outs. Crazy cool Linda! 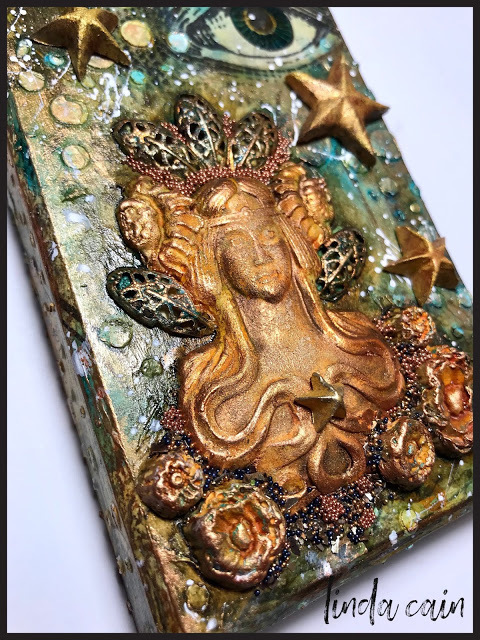 Starlight Princess by Linda Cain! As you can see, Linda Cain has been having a blast playing with all the new Finnabair goodies! 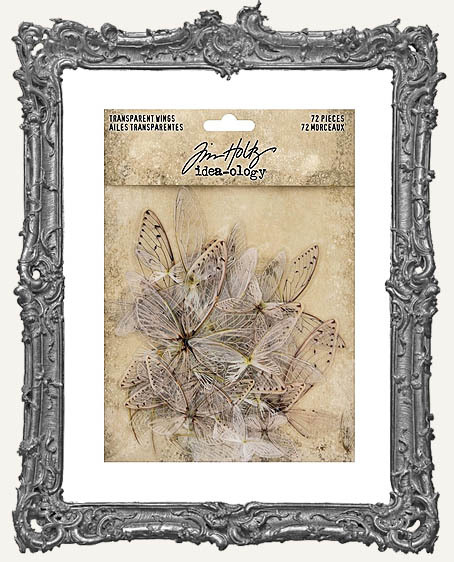 Her canvas below showcases so many of the new products beautifully. 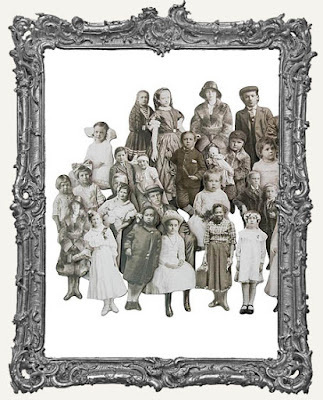 You can read more about this gorgeous canvas on Linda's blog! All of the new Prima Molds have such amazing potential! Below are a few photos of the fun Linda Cain has been having! A few of the molded pieces in the second photo use Porcelain Clay, which is new in the shop.